Since its launch in 2011, Twitch has become one of the hottest live streaming services with over 100 million visitors per month, and with over 1.5 million broadcasters. 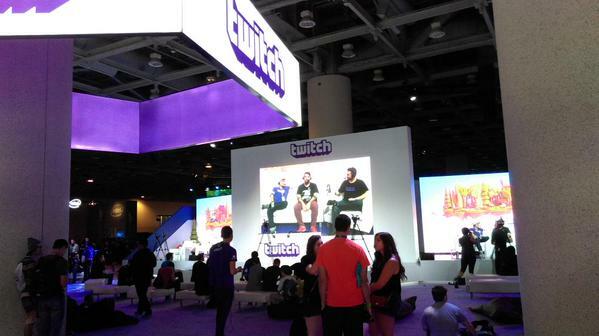 Of course, the next logical step for this company was to hold its first streamer convention: TwitchCon. TwitchCon attracted audiences by emphasizing that it was a “celebration of all things Twitch” as mentioned on their website. Viewers and gamers could meet their favorite streamers, sit in on over 40+ panels, check out upcoming beta games, hardware, and retail items, and of course, purchase some sweet, sweet Twitch merchandise. My favorite encounters at TwitchCon were when I ran into my favorite Twitter people and was able to talk to them like we were life long friends. I was manning the Alienware truck and directly across from us was the Deep Silver booth. The amazing Lindsay Elyse (@ohhlindsayelyse) was there and after much confidence boosting, I walked on over. She was one of the most down to earth people I had ever met and she joked about how she made her husband wait in line for 3 hours to purchase one of each Twitch item. It felt like we were sitting in a cafe, catching up on each other’s lives over coffee. It was a pretty surreal experience for me and made quite the lasting impression. Over that weekend, I ran into a couple of my favorite people including Kelly Kelley (@mrsviolence), Kat Contii (@KatContii), Docgotgame (@docgotgame), Obiwanshinoobie (@Samos89), Anna Maree (@rxysurfchic), Rachel Quirico (@SeltzerPlease), Scarfino (@scarfino), and Curtis Brown (@mobilesinper). There are many more people I would like to mention but I might be here all day. Many of my interactions were similar to this and were a pleasant surprise. I figured everybody would be courteous and friendly but the Twitch bond that we shared was deeper than that. When you are a part of Twitch, you are a part of a larger family and it showed. We are all passionate about video games, about showcasing our personalities, and about relating this experience to new people. Because of this mutual understanding, it brings a lot of us closer and gives us a sense of group direction. Whether you are a streamer, or a viewer, Twitch affects our lives in a positive way everyday. TwitchCon took on new levels of meaning for me. It meant an enhanced appreciation for streamers and the grueling work they put into their streams and videos. It meant fangirling (or fanboying) with your favorite streamer or getting to know other video gamers on a new, profound level. TwitchCon represented all of the amazing things that we have achieved in video games and of inspiring things to come. I am truly excited for next year’s event. This warm, fuzzy feeling is genuinely touching and I never want to let this feeling go. Thank you, TwitchCon for bringing video game possibilities to life and for bringing our community together. And thank you, streamers for opening up to us and for sharing your lives. I tip my screen to you. This entry was posted in Articles, Reviews and tagged community, confidence, encounters, family, friendly, friends, interactions, live, meaning, service, streamer, streaming, surreal, twitch, twitchcon, twitter, viewer. Bookmark the permalink.